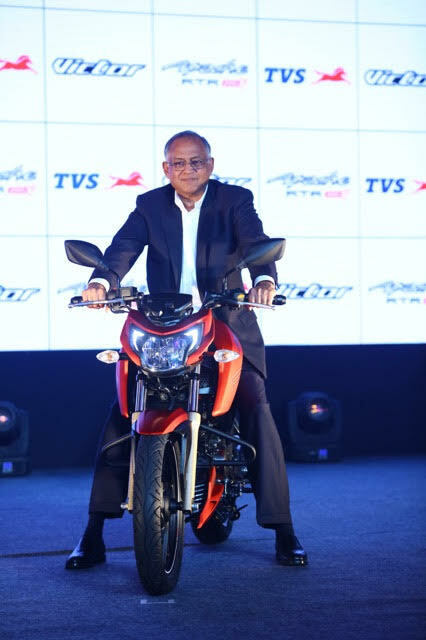 TVS Motor Company, Country’s biggest two wheeler manufacturers has launched two new motorcycles in India – TVS Apache RTR 200 and TVS Victor. The launch event of RTR 200 and Victor was held in Chennai of India. These versatile and visually exciting motorcycles will be positioned in the premium and executive segments respectively. Poised to be game changers in their respective segments, both products set the benchmark even higher with emphatic design language, class leading technology and an arresting interplay of attractive graphics. With this launch, the company now has the widest product portfolio. 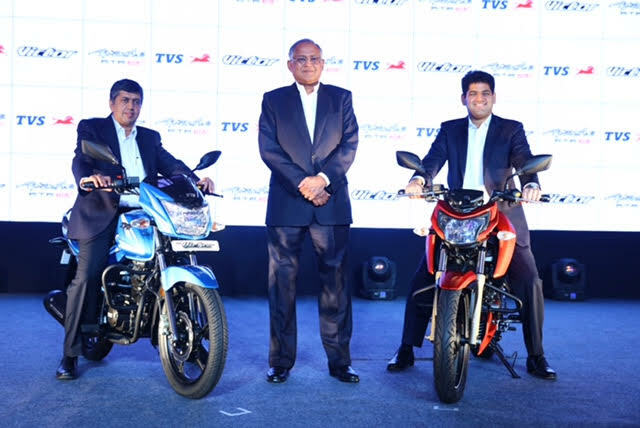 TVS Motor has been at the forefront in bringing new and relevant technology to our customers. TVS Motor, is defined by its state of the art engineering, excellence in technology and superior quality of products. Our commitment to our customers is our primary focus. This launch is yet another reiteration of the TVS promise, to deliver high quality, customer centric products. The success of TVS Victor first launched in 2002 laid the foundation for TVS Motor in India. We are constantly evolving our products to offer technologically superior and youthful products to our customers. We believe that both TVS Apache RTR 200 and TVS Victor are world-class products as they take a big step forward in terms of performance with ride and handling so as to deliver complete rider control and comfort. They complement our existing product portfolio and have a strong potential in its respective segment. We have no doubt that both these motorcycles will be well accepted by our customers and will further spur the sales momentum that we have accrued over the last year. First launched in the year 2002, TVS Victor had a glorious run. Among the top-selling commuter segments bikes in the country, TVS Victor was the first product indigenously developed by TVS Motor. It received excellent reception from buyers and took the market by storm clocking over 40,000 units each month way back in 2002. The TVS Victor, now comes in an all-new avatar. It is an ideal combination of modern styling, superior engine performance and class leading comfort. It houses an advanced and refined 3-valve Ecothrust engine, which is tuned to deliver the optimum combination of power and fuel economy. An electric start fires up the 4 speed powertrain to churn out 9.6 PS of power@ 8000 rpm with a torque of 9.4 Nm @6000 rpm. Designed to suit customers looking for comfort, safety and handling, the new TVS Victor delivers an excellent mileage of 76 km/l under standard TVS test conditions. It carries an 8 liter fuel tank (including 2 liter reserve). The motorcycle has a wheelbase of 1260 mm with a ground clearance of 175 mm. TVS Victor comes in both disc and drum brake versions and is built on single cradle tubular frame. Telescopic oil damped front suspension and 5 step adjustable hydraulic series spring suspension at the rear ensure smooth ride and handling. A broad seat adds to the comfort of the motorcycle. TVS Victor comes with new mirrors and instrument panel. The new 55 watt headlight is brightest in the segment. TVS Victor will be available with both Disc and Drum options and in six impressive colours with attractive contrasting graphics including Red, Black Red, Black Silver, Grey, Silver & Blue. As expected the all new TVS Apache RTR 200 was expected to be launched in India on January 20. Designed to deliver an adrenalin rush with an exhilarating race performance, TVS Apache RTR 200’s advanced four valve racing O3C oil cooled oversquare, five-speed engine is equipped with balancer shaft mechanism and is programmed to whip up an impressive 20.5 PS @8500 rpm with a torque of 18.1 Nm @ 7000 rpm Apache RTR 200 also comes with a EFi variant and will be available in Indian & International markets. For the first time in the 200cc segment, TVS has introduced an oil cooled combustion chamber with ram air assist, which enables the motorcycle to achieve a top speed of 128 km/h with an astounding performance of 0-60 km/h in a mere 3.9 seconds. This makes it one of the fastest accelerating motorcycles in its segment. Racing origin split construction double cradle chassis with radically improved torsional and lateral stiffness aid in exceptional control and maneuverability. The bike’s high flow double barrel exhaust system not only ensures smooth outflow of exhaust but also adds to the aesthetics of the TVS Apache RTR 200. Enhancing the performance and handling capabilities of the TVS Apache RTR 200 is a custom made Monoshock Suspension. The bike also boasts of a fully digital race diagnostic speedometer with 0-60 km/h and fastest lap time display. The bike comes with high grip, wide aspect ratio Remora tubeless tyres (with option of Pirelli tyres for special racing performance). The bike is equipped with petal discs and advanced double channel ABS with rear liftoff protection (RLP) facility. TVS Apache RTR 200 sports a brand new hyper aggressive design language. Precise lines and clean edges with bold, racing inspired contrasts best describe the bike. The aesthetically crafted fuel tank can hold up to 12 liters of petrol (including reserve). The Apache RTR 200 is equipped with electric -start and comes in six stunning matte finishes including yellow, red, white, titanium grey and black. Glossy black is also available as an option. The Apache RTR 200 will be available in both EFI and Carburetor versions with an option of Pirelli tyres.